In Estudio de Laso we use 100% organic products for all of our hair and beauty treatments, offering exceptional quality products that contain no chemicals or any other elements that may damage your health in the long term. Trust in the best professionals and try our treatments, we are confident you will love them. No matter if you are a man or a woman, in our salon we can offer you the latest and most sophisticated haircuts. We cut your hair professionally adapting the latest trends to every client’s style. 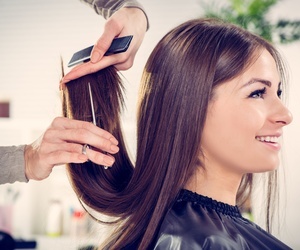 Our staff will advise you about the most flattering haircuts based on your facial features. Flaunt a different look with our wide range of haircut options. Do you want to change your hair colour? Come to our salon and we will advise you. We offer a wide range of colours so you can choose the option that seduces you the most. With our colouring, you will change your hair colour and achieve a natural glow, silky appearance and a long lasting colour. Come visit us and ask your questions. We will be glad to help you. Tuesday to Friday from 10:30 to 13:30 and from 17:30 to 20:30. Saturday from 10:00 to 14:00.